Mega Sale! Save 29% on the Carex Soft Grip Derby Cane, Black, Height Adjustable Designer Cane with Wrist Strap and Latex-Free Soft Cushion Handle by Carex Health Brands at Get Cheap Health Insurance. MPN: A52000. Hurry! Limited time offer. Offer valid only while supplies last. Carex Soft Grip Canes have a soft grip that's both ergonomic and anti slip. Comes in black, blue, and pink al with convenient wrist straps. Carex Soft Grip Canes have a soft grip that's both ergonomic and anti slip. Comes in black, blue, and pink al with convenient wrist straps. Innovative Soft Grip technology reduces pressure on the wrist. 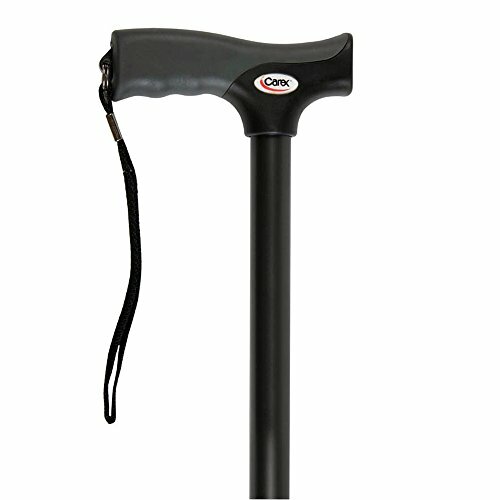 Contains (1) Carex Soft Grip Derby Cane in black. The Carex Soft Grip Derby Cane in black features a soft grip, latex-free handle to decrease shock and hand fatigue. Easily adjustable height with the push of a button and includes a convenient wrist strap. The soft grip handle features innovative technology that decreases shock and reduces fatigue in the hand and upper body. The ergonomic handle is adaptable for right- & left-handed users, providing walking support without the shock & fatigue of other canes. The Carex Soft Grip Derby Cane features an easily adjustable, latex-free handle that adjusts with a simple push of a button. The convenient wrist strap secures the cane to your wrist for added security and support in the form of a comfortable, sturdy cane. Ergonomically designed, the Carex Soft Grip Derby Cane has an anti-slip tip to provide extra traction and stability. With the height adjustment, soft grip handle, and ergonomic design, it reduces impact for a dependable, walking device that is supportive.